Dan David is Kanien’ke:haka, an award-winning writer and journalist, based at Kanehsatà:ke Mohawk Territory near Oka in southern Quebec. One day, an old friend handed me a paper. He said it was a true story. It went like this: An Iroquois (Haudenosaunee) raiding party attacked an Anishinaabe village. A beautiful maid convinced the Haudenosaunee to take her and spare the village. Mesmerized by her beauty, the Haudenosaunee agreed and paddled their canoes downriver. But, enthralled by the maid in the lead canoe, they failed to notice the rapids and deadly falls. Over they went to their doom. My friend said they named the place Iroquois Falls to honour the maid’s sacrifice. Of course, the story is nonsense. Places are named for all kinds of reasons; reminders of home, a link to a homeland, to erase what was there before, and many more. Stories like that, however, have had me thinking about place names, or toponyms, ever since. When you put a name on a map or you change the name of a place, you impose your own name. Recently, Montreal’s former mayor, Denis Coderre, rekindled my interest in place names. In the summer of 2017, he held a ceremony to rename the Outremont peak of Mont Royal, a key feature of Montreal’s landscape, by its Mohawk name: Otsirankéhne (at the fire). 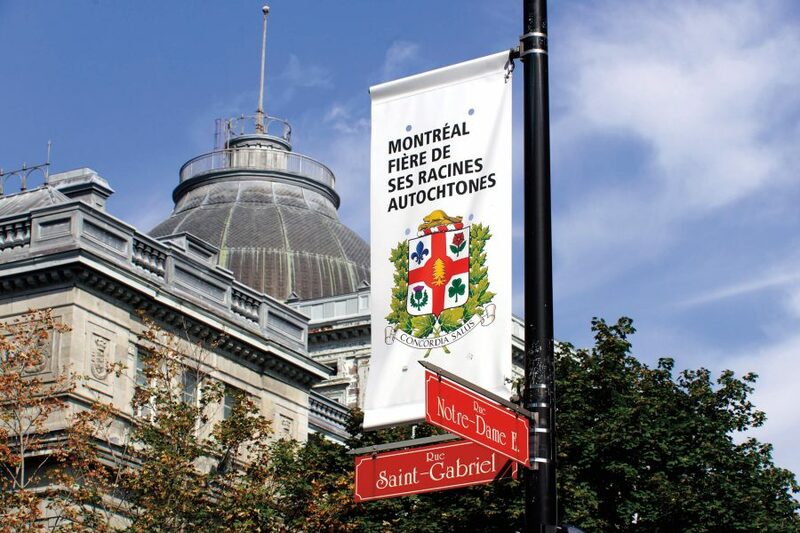 A few months later, he added a “white pine tree” to the centre of the city’s coat of arms and flag, anchoring various groups important to the founding of Montreal: the Irish shamrock, English rose, Scottish thistle, and French fleur-de-lis. A pine tree is also at the centre of the Hiawatha wampum belt, symbolizing the union of the Six Nations (Haudenosaunee) Confederacy. The Mohawk are one of the six nations of the Haudenosaunee Confederacy. Finally, the former mayor said “Goodbye, Mr. Amherst.” Coderre pledged to rename a major street that honours the first Lord Amherst, British general Jeffrey Amherst. During the French-Indian Wars of the 1700s, Amherst ordered smallpox-infected blankets to be sent to the Indigenous Peoples of the region surrounding Montreal (and, indeed, well beyond this area) — something protesters condemned as attempted genocide. Coderre said he did all of the above in the name of “reconciliation” with Indigenous Peoples on this 10th anniversary of the United Nations’ Declaration on the Rights of Indigenous Peoples, the 150th anniversary of Confederation and the 375th anniversary of Montreal. It has also been 300 years since King Louis XV of France issued a land grant to the Sulpician Order (the Seminary of St. Sulpice) “in trust” for the Mohawk. This planted the seeds for a dispute over title to this territory that eventually led to the 1990 Oka Crisis. This is a dispute that still continues today. In 2017, Montreal unveiled the city’s new coat of arms, which include a white pine tree to reflect Indigenous contributions to the city. Which brings us to a map at the Tsi Ronterihwanónhnha ne Kanien’kéha Language and Cultural Centre at Kanehsatà:ke, Que. The map outlines the original area of the 1717 grant. The map is titled “Pre-Contact Place Names of Kanehsatà:ke Kanien’ke:háka Territory.” It outlines an area about 15 kilometres by 15 kilometres, stretching from the village of Oka in the south to just short of Saint-JérÔme in the north. At first glance, it looks like any map. But a closer look reveals large red numbers and hash marks, and an index connects each of these numbers and marks to a Mohawk place name. Hilda Nicholas, the director of the language and cultural centre, calls these names more of a description. “Even our names sometimes describe the kind of weather that was happening when you were born. There’s a meaning behind why you have a certain name.” My sister’s granddaughter is named Kawisaienhne, or “she brings the ice.” Prophetic since she was born the day before a massive ice storm devastated eastern Canada in 1998. I ask about surrounding villages called Saint-Benoît, Saint-Placide and Saint-Eustache. Places on the map show where cornfields existed, fishing took place, and medicinal plants could be found. Each is described by geographic markers: a river, an island, a hill. So what happened to those connections to the land when the place names changed? Derek A. Smith, a cultural geographer at Carleton University in Ottawa, explains that place names were changed as colonists put their own stamps on the land for reasons that had little or nothing to do with the geography. It was about control. “When you put a name on a map or you change the name of a place, you impose your own name. That’s a way of asserting your authority over the territory,” Smith explains. Colonists would assert their authority on the landscape by enforcing the dominance of their language and religion. There are many examples of this, including places renamed after saints, or place names connected to the royal families back in Europe.